Third party software developers who want their programs to function properly under Microsoft's upcoming operating system Windows 8 need to focus their attention on two new areas. The start page is the first and without doubt the most difficulty to work with as it is restricting apps significantly that run here. The second area is touch, which is one of the improved features of Windows 8, and if you take the hardware announcements of this year's IFA as an indicator, one of the main focuses of hardware manufacturers when it comes to Windows 8 powered devices. Browser developers like Mozilla or Google have already started their work on a version of their browser for the operating system's modern user interface, formerly known as Metro. Opera Software on the other hand kept quite until now, which may be attributed to the much smaller nature of the company, different priorities, or both. 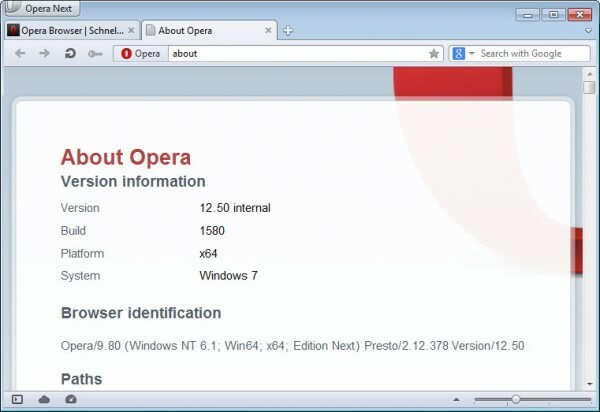 The company has released a new snapshot of its upcoming Opera 12.50 web browser today, and one of the new features that it adds to the table is better support for touch-based devices running on Windows 7 or Windows 8. The changelog lists four touch-specific features that the company has integrated into the snapshot. The initial improvements are for the classic version of Opera, as opposed to the modern ui version of it. Opera users that use touch-capable devices can use the newest build to scroll and move web pages and elements in Opera using touch, including touch zoom and inertial scrolling. Opera 12.50 is only available as a development build right now, and while that may not be an issue at all, you may experience issues such as crashes, freezes and maybe even data loss as a consequence. It is therefor recommended to backup the operating system and browser before you install the new version. Interested users can download the latest Opera snapshot build from the Opera Desktop Team blog website. What's interesting in this regard is that Opera seems to - at least - think about creating an Opera app for the start page of Windows 8. Why won’t they? Would it benefit them if they didn’t? It is a question of available resources I would guess. Would you rather create a feature for an operating system that is not released yet, or prefer to improve your existing product? The Opera Next line can be installed alongside the regular installation of Opera. Just make sure it points to a separate folder on installation. You can even install it portably this way on a USB drive. FYI, I’m finding the 12.5 line to be more stable than the main line, as long as I keep tabs to under about 10. In my view, opera made a major customer relations mistake releasing such a buggy 12.0x full version, but they are working their way out of it slowly. Much as FF is a great browser, I still prefer Opera greatly. You are right of course. I did not have the time to test the browser extensively, but agree that the update to 12.x seemed rushed. 12.01 and 12.02 never crashed here. Had few on 12.5 snashot, and the latest severely broke extension. So back to 12.02 for now. I’ve been a happy Opera user for many years. It is very fast!! I occasionally use Chrome and IE, too, but Opera is AWESOME at blocking pop-ups. Plus, I love how I can right-click and block an ad. I wish the other browsers had this feature. The other browsers seem sluggish compared to Opera. At least on my laptop. COLLEGE FOOTBALL HAS ARRIVED, BABY! For me, Opera 12 has been the buggiest version of them all… it even crashed my video driver a couple of times! I needed to reinstall Opera from scratch, because it would not even run and would crash again when this happened!